World renowned Miami is only 90 minutes down the highway for either day or overnight trips - Currently one of the top destinations in the world, Miami is experiencing a boom. All of the major theme parks including Walt Disney World, Universal Studios & SeaWorld all located in Orlando and are only 90 minutes up the highway for family fun day trips - Stay at PGA and drive right to the Disney parking lot in 90 minutes then return to PGA in the evening. World class shopping in Palm Beach on Worth Ave is a short 40 minutes away - West Palm and Palm Beach have shops that rival anywhere in the world. Renowned Jupiter Island with power boat rentals and plentiful golf is a short 30 minute drive away - Jupiter is the new home for the super-rich and many famous athletes. Two of the world’s best golf course designers have built four courses on site at PGA - Tom Fazio and Pete Dye built their award winning courses under the PGA brand making this location top 20 of all courses in Florida according to Golf Digest 2015 summary. 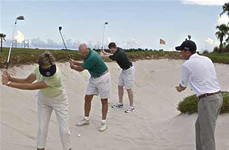 Excellent on-site courses are the three PGA Golf Club courses located at PGA Village –1-800-800-GOLF or 561-467-1300. They are only 2 minutes from the villas. The Castle Pines Villas are located adjacent to the 15th and 16th holes of the Pete Dye Course. There are now four courses in this complex with three open to the public, the North, South and Dye. 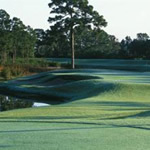 The South Course, a classic Old Florida-style course, is set on wetlands and offers views of native wildlife. A 6 hole practice course (described as the best in the world), is also available free of charge. Located by the Clock Tower and requires wedges and a putter. In addition, the private PGA Country Club Course is located 1 mile down the road on Prima Vista Blvd. If you choose to reserve your golf within 9 days of playing, you are welcome to book your own tee-time (at reduced rates) by calling (800) 800-GOLF (4653). When booking within 9 days, green fees are usually $25 to $75 and cheaper the closer you book to the day of play. A major component of PGA Village is The PGA Learning Center. The Center offers the only PGA of America Golf Schools with programs ranging from one to three days that were created by The PGA Teaching Department and led by PGA Director of Instruction, Rick Martino, 1997 National PGA Teacher of the Year. The staff are qualified PGA Professionals who offer all levels of instruction including clinics and private lessons. The Treasure Coast beaches are gorgeous and run for miles and miles with numerous entry points and parking lots. The nearest beach to PGA Village would be over the Jensen Beach Causeway located on S. Hutchinson Island. The New York Mets hold spring training in Port St. Lucie from late February through March at the Thomas J. White Stadium, 525 NW Peacock Blvd., (561-871-2115). 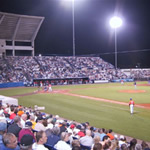 From April though August, their farm team, the Port St. Lucie Mets, play home games in the stadium, which is located across I95 from PGA Village. St. Lucie River Tours offers intriguing tours of the St. Lucie River The 2-hour historical and wildlife tours go through winding waterways that are home to hundreds of wading birds and reptiles.